Vincent Medina (left) and Louis Trevino are co-founders of mak-'amham. There are no people with a deeper connection to the East Bay than the Ohlone, the original people of this area. Yet so little is known about Ohlone people and culture due to colonization. 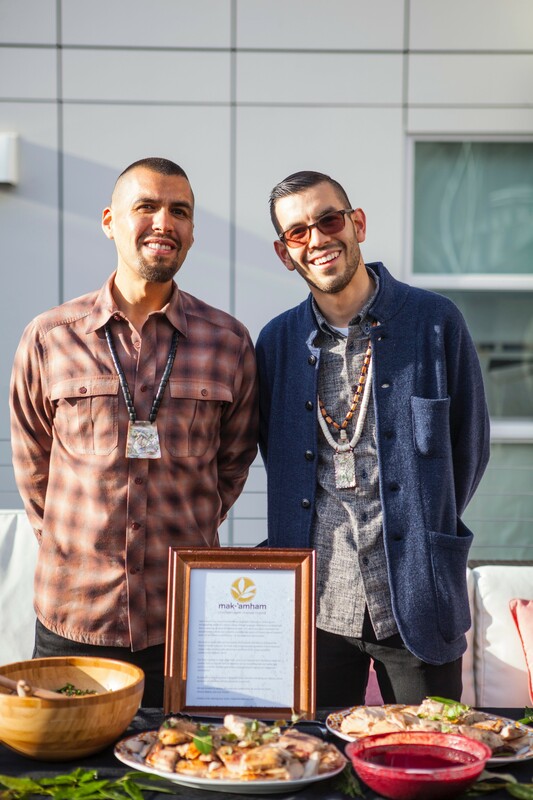 Through a new cafe called Café Ohlone by mak-‘amham, Vincent Medina and Louis Trevino hope to bring back traditions by serving modern Ohlone food — the only restaurant of its kind anywhere. The two trace their roots back many generations, Medina from what is now known as the East Bay and the Muwekma Ohlone Tribe and Trevino from the Carmel Valley and the Rumsen Ohlone community. Together, they created mak-‘amham, which means “our food” in the Chochenyo language of Medina’s tribe. Both see food as one avenue to connect their own communities as well as non-indigenous people to Ohlone culture. They started by hosting community meals in their homes, organizing pop-ups, and collaborating with other organizations, such as the People’s Kitchen Collective. This September, Café Ohlone by mak-‘amham will open in Berkeley (2430 Bancroft Way), in the back patio area of University Press Books. The small-bites spot will be open three days a week, Thursday through Saturday. The seasonal menu will include teas made with ingredients such as yerba buena, elderberry, and rose hips, gathered locally and blessed in traditional ways. There will be hand-pressed hazelnut or walnut milk; coffee infused with local bay or piñon nuts; acorn flour brownies; seed cakes; native greens salad; and quail eggs with walnut oil. While the food and drink may be tasty, it’s also a pathway to connecting with culture, history, storytelling, language, geography, art, and other traditions such as basket-weaving. Their website is noteworthy too, full of language and information that manages to avoid feeling didactic while still being very educational. It’s been at least two generations since Ohlone people spoke their languages at home, they said. On the website, there is a recording of how to pronounce “mak-‘amham” and there are descriptions of their vision, the dishes, and more. Medina serves on the board of Advocates for Indigenous California Language Survival, and the two met at an indigenous language workshop at UC Berkeley. Mak-‘amham also caters and plans to host quarterly events such as dinners honoring elders and families or workshops on how to gather ingredients. “People are already proud of who they are, but when they get to see it practiced in a big way, it makes them more proud,” Trevino said. Editor's note: An earlier version of this article stated Trevino is part of the Rumsen Ohlone Tribe. Rumsen Ohlone community is more accurate.